Soulcalibur VI is a fighting game in the Soulcalibur series developed by Bandai Namco Studios and published by Bandai Namco Entertainment for the PlayStation 4, Xbox One, and Windows in 2018. Soulcalibur VI received mostly positive reviews, with praise being directed at its gameplay and faithfulness to the series. Following the tradition of prior installments of the Soulcalibur series, Soulcalibur VI's gameplay involves two weapons-wielding combatants battling against one another using a 3D system. 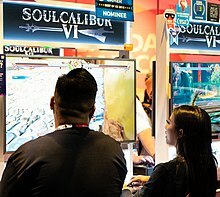 The game kept many of the familiar gameplay elements including 8-Way Run, Guard Impact, and character creation, but adds to the traditional formula by introducing new mechanics such as Reversal Edge and the newly revamped Soul Charge. The Reversal Edge allows players to defend against an oncoming attack and quickly strike back, alongside a slow-motion effect, enabling more defensive options for the players. Soulcalibur VI contains a base roster consisting of 21 fighters. Additional characters are added through DLC after the game's launch. There are also 100 slots for custom characters. New characters introduced in Soulcalibur VI are marked in italics. Soulcalibur VI was announced during The Game Awards 2017. Development on the game began over three years earlier. Producer Motohiro Okubo called the game a celebration of the franchise's 20th anniversary. Bandai Namco focused more on story elements than in the previous games in the series. It runs on Unreal Engine 4 like Bandai Namco's previous fighting game, Tekken 7. According to Okubo, the title's code name was "Luxor" due to the team's intentions on making the game feel brighter like it was in the first Soulcalibur. Additional mechanics were introduced to help players with the game's learning curve. The game was released for PlayStation 4, Xbox One, and Windows on October 19, 2018. Its Collectors Edition came with an art book, a soundtrack, a Sophitia statue, and a metal case. A season pass for the game includes four additional characters and more items for character customization. Soulcalibur VI game was well received. Game Informer and EGM both praised the story modes. VideoGamer.com praised the graphics, while Destructoid praised the music and the character roster. Game Revolution reviewer opined it was "one of the most enjoyable fighting games I’ve ever played." IGN summarised it: "The new mechanics add new layers of strategy and mind games while the one-two punch of Libra of Soul and Soul Chronicle will provide hours upon hours of fantastic single-player content." 4Players praised the netcode, while HobbyConsolas praised the character creation. GameSpot's Tamoor Hussain said it was "both intuitive and deep". Dead or Alive 6 director and producer Yohei Shimbori commented he could not understand why his series is being criticized so much for the fan service content while Soulcalibur VI "can do it and doesn’t get a beating over it." The game reached number 5 in the UK sales chart. In Japan, it sold 24,049 copies within its first week on sale, reaching number 3. It reached number 8 in Australia and number 7 in New Zealand. In the USA, it was the 8th most downloaded game of October on the PlayStation Store. 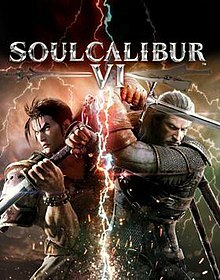 Sales were reported to be up from Soulcalibur V and compared to Soulcalibur III, Soulcalibur and Soul Blade, but still lower than Soulcalibur II and Soulcalibur IV. In 2019, Namco reported the launch as "successful". ^ "Soul Calibur VI Interview: Just Guard, Evo and More!". Prima Games. Retrieved April 5, 2019. ^ Kai, Xena (September 1, 2018). "Come take a pic with me #cosplaying Taki at #PAXWest2018 #SoulCaliburV". @XenaKai. Retrieved April 17, 2019. ^ Hussain, Tamoor (December 8, 2017). "Soul Calibur 6 Announced, First Gameplay Details Revealed". GameSpot. Retrieved December 8, 2017. ^ "SOULCALIBUR VI - 2B Character Reveal Trailer". YouTube. October 27, 2018. Retrieved October 27, 2018. ^ "SOULCALIBUR VI - Amy Character Reveal Trailer". YouTube. February 16, 2019. Retrieved February 17, 2019. ^ a b "SOULCALIBUR VI - Astaroth and Seong Mi-Na EVO Trailer Reveal Trailer". YouTube. August 5, 2018. Retrieved August 5, 2018. ^ "SOULCALIBUR VI - Azwel Character Reveal Trailer". YouTube. August 26, 2018. Retrieved August 26, 2018. ^ "SOULCALIBUR VI - Cervantes Reveal Trailer". YouTube. September 12, 2018. Retrieved September 12, 2018. ^ "Play as Geralt of Rivia in SOULCALIBUR VI!". CDPR. March 16, 2018. Retrieved March 16, 2018. ^ a b c d McWhertor, Michael (January 25, 2018). "New Soulcalibur 6 trailer confirms Nightmare, Kilik and Xianghua". Polygon. Retrieved January 25, 2018. ^ "SOULCALIBUR VI - Inferno Character Reveal". YouTube. October 4, 2018. Retrieved October 4, 2018. ^ "SOULCALIBUR VI - Ivy Character Reveal". YouTube. February 22, 2018. Retrieved February 22, 2018. ^ "SOULCALIBUR VI - Maxi Reveal Trailer". YouTube. May 31, 2018. Retrieved May 31, 2018. ^ a b Devore, Jordan (December 8, 2017). "Soulcalibur VI will cover the events of the original". Destructoid. Retrieved December 8, 2017. ^ "SOULCALIBUR VI - Raphael Reveal Trailer". YouTube. September 18, 2018. Retrieved September 18, 2018. ^ "Soulcalibur 6 - Siegfried Reveal". YouTube. April 12, 2018. Retrieved April 12, 2018. ^ "SOULCALIBUR VI - Taki Character Reveal". YouTube. May 1, 2018. Retrieved May 1, 2018. ^ "'SoulCalibur VI' gets a new roster addition with Talim". July 5, 2018. ^ "Soulcalibur 6 - Tira (DLC Character announcement trailer)". YouTube. August 21, 2018. Retrieved August 21, 2018. ^ "SOULCALIBUR VI - Voldo Reveal Trailer". YouTube. July 20, 2018. Retrieved July 20, 2018. ^ "SOULCALIBUR VI - PS4/XB1/PC - Yoshimitsu (character announcement trailer)". YouTube. May 18, 2018. Retrieved October 5, 2018. ^ "SOULCALIBUR VI - Zasalamel Character Reveal". YouTube. February 22, 2018. Retrieved February 22, 2018. ^ Reilly, Luke (December 8, 2017). "Soulcalibur 6 Announced, Coming 2018". IGN. Ziff Davis. Retrieved December 8, 2017. ^ Kim, Matt (December 8, 2017). "Soulcalibur 6 Will Take Place During the Events of the First Game". USGamer. Retrieved December 8, 2017. ^ Romano, Sal (December 7, 2017). "Soulcalibur VI announced for PS4, Xbox One, and PC". Gematsu. Retrieved December 8, 2017. ^ GameCentral (December 18, 2017). "Game preview: SoulCalibur VI hands-on and interview – of souls and swords". Metro. Retrieved December 20, 2017. ^ McWhertor, Michael (December 7, 2017). "Soulcalibur 6 announced, coming in 2018". Polygon. Retrieved December 8, 2017. ^ a b Romano, Sal (December 9, 2017). "10 minutes of Soulcalibur VI gameplay, producer interview". Gematsu. Retrieved December 9, 2017. ^ Conditt, Jessica (December 7, 2017). "'Soul Calibur VI' hits Steam, PS4 and Xbox One in 2018". Engadget. Retrieved December 8, 2017. ^ Perez, Cody (December 7, 2017). "Soul Calibur 6 Revealed at The Game Awards 2017". Game Revolution. Retrieved December 8, 2017. ^ McWhertor, Michael. "Soulcalibur 6 is coming Oct. 19". Polygon. Retrieved September 23, 2018. ^ "Bandai Namco shows off the goodies included in the SoulCalibur VI Collector's Edition". Shoryuken. October 12, 2018. Retrieved December 5, 2018. ^ "Soulcalibur VI: Pre-order Editions". Fextralife. June 19, 2018. Retrieved June 25, 2018. ^ "SoulCalibur VI for PC Reviews". Metacritic. CBS Interactive. Retrieved March 5, 2019. ^ "SoulCalibur VI for PlayStation 4 Reviews". Metacritic. CBS Interactive. Retrieved March 5, 2019. ^ "SoulCalibur VI for Xbox One Reviews". Metacritic. CBS Interactive. Retrieved March 5, 2019. ^ a b Carter, Chris (October 20, 2018). "Review: Soulcalibur VI". Destructoid. ^ a b Patterson, Mollie L. (October 19, 2018). "Soulcalibur VI review". EGMNow. ^ a b Vazquez, Suriel (October 19, 2018). "Soulcalibur VI Review – Burning Brighter Than Ever". Game Informer. ^ a b Faulkner, Jason (October 17, 2018). "Soul Calibur 6 Review - It's Got Soul". Game Revolution. ^ a b Hussain, Tamoor (October 22, 2018). "SoulCalibur 6 Review - The New Legend". GameSpot. ^ a b Saltzman, Mitchell (October 17, 2018). "Soulcalibur 6 Review". IGN. ^ a b Harradence, Mike (October 17, 2018). "SoulCalibur VI review". VideoGamer.com. ^ a b Oertel, Matthias (October 19, 2018). "Soulcalibur 6 - Test, Action". 4Players. ^ a b Martinez, David (October 17, 2018). "Análisis de Soul Calibur VI para PS4, Xbox One y PC". HobbyConsolas. ^ Samuel, Ebenezer (November 19, 2018). "Soulcalibur 6 is a brilliantly layered fighting game: review". New York Daily News. ^ Massongill, Justin (November 8, 2018). "PlayStation Store: October's Top Downloads". PlayStation Blog. ^ Nelva, Giuseppe (January 22, 2019). "Dead or Alive 6 Interview: Director Talks Fanservice, Accessibility, DLC, and Much More". Twinfinite. Retrieved January 24, 2019. ^ Romano, Sal (October 24, 2018). "Media Create Sales: 10/15/18 – 10/21/18". Gematsu. Retrieved November 3, 2018. ^ "Top 10 Charts Australia". iGEA. ^ "SoulCalibur VI sales trail behind II's & IV's; Game figures 6th on October's best-selling list". Shoryuken. November 22, 2018. Retrieved February 24, 2019. ^ Nelva, Giuseppe (February 6, 2019). "SoulCalibur VI's Launch Considered Successful; Bandai Namco Increases Full-Year Prediction". Twinfinite. Retrieved February 24, 2019. ^ Watts, Steve (July 5, 2018). "Resident Evil 2 Wins Top Honor In E3 Game Critics Awards". GameSpot. Retrieved December 12, 2018. ^ "Awards (2018)". The Game Awards. Retrieved November 16, 2018. ^ Trent, Logan (February 11, 2019). "Here Are Your 2019 SXSW Gaming Awards Finalists!". South by Southwest. Retrieved February 16, 2019. Wikimedia Commons has media related to Soulcalibur VI. This page was last edited on 20 April 2019, at 13:51 (UTC).